Scottish, Retreat March (9/8 time). 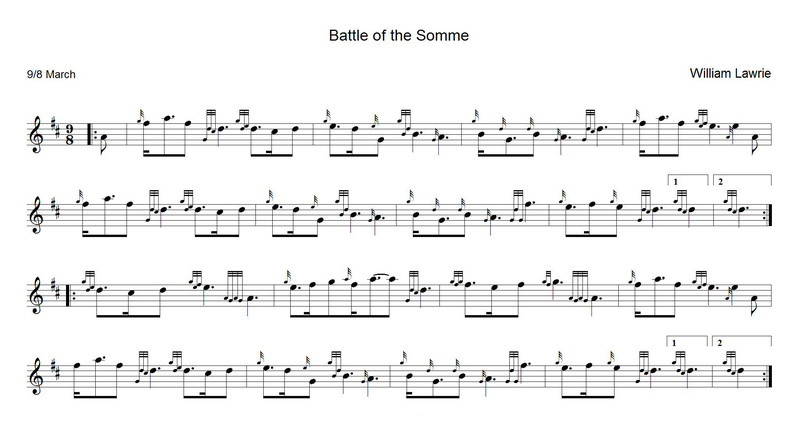 This pipe tune, a retreat composed by William Laurie (1881-1916) commemorates one of the greatest and most terrible battles of World War I which began on 1st July 1916. 58,000 lives were lost by the British troops (one third on the first day). William Laurie fought in this horrendous battle as PM of the 8th Argylls. He died shortly after from illness and injuries sustained in the trenches. He lived just long to see his tune meet immediate success. The retreat is not necessarily a march time tune which would be marched to; often it is played as part of the evening ritual in military camps as day duties gave way to night ones. So “Battle of the Somme” is not linked to the military manoeuvre of retreating in or from battle but is linked to the idea of refuge and safety in the camp. William Lawrie (or Laurie) – The composer. William Lawrie - Gaelic, Uilleam Labhruidh/Laobhrach (1881–1916) was born into a slate quarrying family in Ballachulish, Argyll and was the son of Hugh Lawrie, who gave him his first lessons on the Highland bagpipes. Later he was taught by John MacColl, with whom he remained friends throughout his brief life. In 1910 he became only the second piper ever to win the Gold Medals at both Oban and Inverness in the same year, and he added the Clasp the following year. He won the marches and the strathspeys and reels at Inverness on the same day. In 1914 he succeeded George Ross as Pipe Major of the 8th Argyllshire Battalion of the Argyll and Sutherland Highlanders – the 8th Argylls – and accompanied them to France in 1915. But in 1916 he became ill as a result of trench conditions. He was invalided to England where he died in the Third Southern General Hospital in Oxford on November 28, leaving behind his wife and three children. A "marbhrann" (gaelic lament) was written upon his death by the Islay bard Duncan Johnston (Donnchadh MacIain) who was a close personal friend. 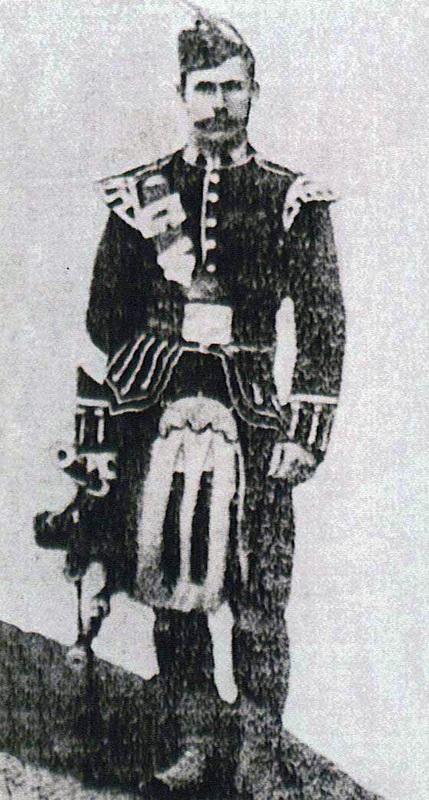 His bagpipes are now on display in The Argyll and Sutherland Highlanders Regimental Museum in Stirling Castle. The death of Willie Lawrie at age 35 in 1916 remains to this day one of piping’s greatest premature losses. His prime legacy is as a composer. His output was small – around 20 tunes – but powerful. His distinctive gift for melody and structure gave us some of the best tunes in the art form: the marches John MacDonald of Glencoe, The Pap of Glencoe, The Braes of Brecklet and Mrs. H. L. MacDonald of Dunach, the strathspey Inveraray Castle, the 4/4 march The 8th Argylls and the 9/8 retreat march The Battle of the Somme, to name a few. These tunes are stunning achievements from a man who was probably one of the most talented pipers and composers of his day. Also called Scottish jig although there is no evidence the Lilt and Scottish Jig are one and the same as the Scottish Jig has a musical style over 100 years earlier than the emergence of the Lilt as a dedicated female dance. The Scottish Lilt is claimed by both the Hebrides and Perthshire. This genteel and flowing dance was composed sometime after 1746 as a solo gentlewoman courting dance to entertain Dukes and other gentry by showing how grateful she could be. 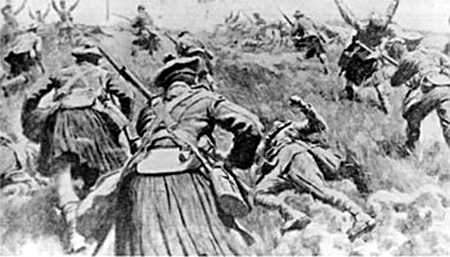 Although the tunes for this dance could be "Drops of Brandy" or "Brose and Butter", it is almost mandatory to play "Battle of the Somme" for this National dance (1) one of the most popular of all dances, largely because of its music which is played in the idiosyncratic 9/8 retreat march time and which suits the steps to perfection. The Lilt exemplifies National dances, as it is very graceful and heavily influenced by ballet. It is an unusual dance because it has only six beats per measure rather than the standard eight and far from the three basic Highland dances which are dances to strathspeys. (1) The National Dances (Scottish Lilt, Village Maid, Blue Bonnets, Flora MacDonald Fancy, Scotch Measure….) 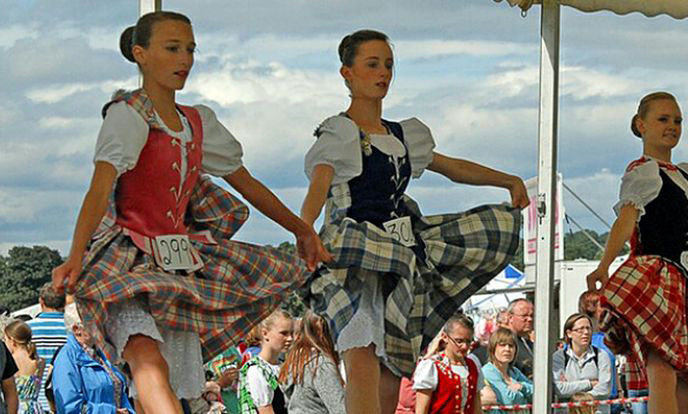 are more modern and a bit more graceful than the vigorous Highland Dances and were developed so women could participate. The costume worn by women is called the Aboyne dress (2) named in honor of the Aboyne Highland Games in Scotland where women were forbidden to wear the traditional too “regimental” Highland outfit. The National Dances are much more rhythmic and balletic; however, they still require quick and precise movements. Nevertheless, some of the National dances are performed in the kilt since they were originally men’s dances such as The Highland Laddie, and Wilt Thou Go to the Barracks, Johnny? Men also perform all of the dances, but they wear the traditional Highland outfit. (2) The "Aboyne Dress" was designed by the Lord Lyon of Arms (Thomas Innes of Learney), and the late Miss Jeannie Hendry, champion dancer, based on researches by the Lord Lyon in 1952. The Lord Lyon is responsible for overseeing state ceremonial in Scotland, for the granting of new arms to persons or organisations, and for confirming proven pedigrees and claims to existing arms. He also registers and records new clan tartans, upon request from the clan chief. Copyright © 2009-2016 Stéphane BÉGUINOT, All Rights Reserved.